Temperate ectomycorrhizal (ECM) fungi show segregation whereby some species dominate in organic layers and others favor mineral soils. Weak layering in tropical soils is hypothesized to decrease niche space and therefore reduce the diversity of ectomycorrhizal fungi.  The Neotropical ECM tree Dicymbe corymbosa forms monodominant stands and has a distinct physiognomy with vertical crown development, adventitious roots and massive root mounds, leading to multi-stemmed trees with spatially segregated rooting environments: aerial litter caches, aerial decayed wood, organic root mounds and mineral soil. We hypothesized that these microhabitats host distinct fungal assemblages and therefore promote diversity.  To test our hypothesis, we sampled D. corymbosa ectomycorrhizal root tips from the four microhabitats and analyzed community composition based on pyrosequencing of fungal internal transcribed spacer (ITS) barcode markers.  Several dominant fungi were ubiquitous but analyses nonetheless suggested that communities in mineral soil samples were statistically distinct from communities in organic microhabitats. These data indicate that distinctive rooting zones of D. corymbosa contribute to spatial segregation of the fungal community and likely enhance fungal diversity. 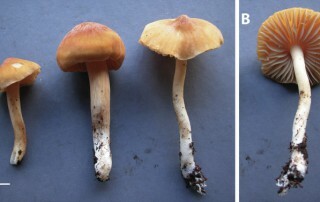 A new genus and three new species of Agaricales are described from the Pakaraima Mountains of Guyana in the central Guiana Shield. All three of these new species fruit on the ground in association with species of the ectomycorrhizal (ECM) tree genus Dicymbe (Fabaceae subfam. Caesalpinioideae) and one species has been shown to form ectomycorrhizas. Multi-locus molecular phylogenetic analyses place Guyanagarika gen. nov. within the Catathelasma clade, a lineage in the suborder Tricholomatineae of the Agaricales. We formally recognize this ‘Catathelasma clade’ as an expanded family Catathelasmataceae that includes the genera Callistosporium, Catathelasma, Guyanagarika, Macrocybe, Pleurocollybia, and Pseudolaccaria. Within the Catathelasmataceae, Catathelasma and Guyanagarika represent independent origins of the ectomycorrhizal habit. Guyanagarika is the first documented case of an ECM Agaricales genus known only from the Neotropics. 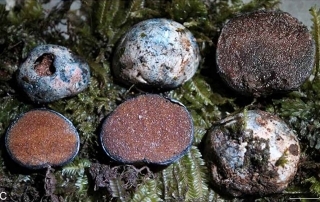 The sequestrate false truffles Elaphomyces favosus, E. iuppitercellus, and E. labyrinthinus spp. 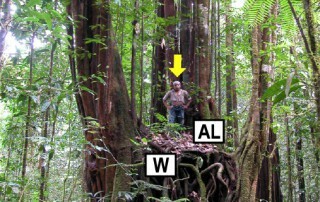 nov. are described as new to science from the Dja Biosphere Reserve, Cameroon. Elaphomyces adamizans sp. nov. is described as new from the Pakaraima Mountains of Guyana. The Cameroonian species are the first Elaphomyces taxa to be formally described from Africa, occurring in lowland Guineo-Congolian tropical rainforests dominated by the ectomycorrhizal (ECM) canopy tree Gilbertiodendron dewevrei (Fabaceae subfam. Caesalpinioideae). The Guyanese species is the third to be discovered in lowland tropical South America, occurring in forests dominated by the ECM trees Pakaraimaea dipterocarpacea (Dipterocarpaceae) and Dicymbe jenmanii (Fabaceae subfam. Caesalpinioideae). Macromorphological, micromorphological, habitat, and DNA sequence data are provided for each new species. 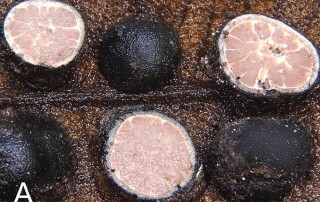 Molecular and morphological data place these fungi in Elaphomycetaceae (Eurotiales, Ascomycota). Unique morphological features are congruent with molecular delimitation of each of the new species based on a phylogenetic analysis of the rDNA ITS and 28S loci across the Elaphomycetaceae. The phylogenetic analysis also suggests that a common ancestor is shared between some Elaphomyces species from Africa and South America, and that species of the stalked, volvate genus Pseudotulostoma may be nested in Elaphomyces. Binderoboletus segoi gen. and sp. nov., Guyanaporus albipodus gen. and sp. nov. and Singerocomus rubriflavus gen. and sp. nov. (Boletaceae, Boletales, Basidiomycota) are described from the Pakaraima Mountains and adjacent lowlands of Guyana. Xerocomus inundabilis, originally described from the central Brazilian Amazon and based solely on the type collection, is redescribed from numerous collections from Guyana and transferred into Singerocomus. 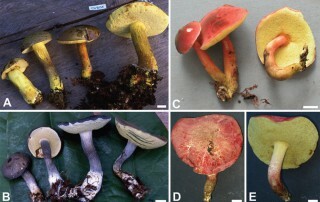 These boletes occur in Neotropical forests dominated by ectomycorrhizal trees in the genera Dicymbe (Fabaceae subfam. Caesalpinioideae), Aldina (Fabaceae subfam. Papilionoideae) and Pakaraimaea (Dipterocarpaceae). Three of the species were repeatedly found in a multiyear sporocarp survey in Dicymbe corymbosa-monodominant forest. Macromorphological, micromorphological, habitat and multilocus DNA sequence data are provided for each species. A molecular phylogenetic analysis based on a large taxon set across the Boletaceae justifies erection of the new genera. Jimtrappea guyanensis gen. sp. nov., Castellanea pakaraimophila gen. sp. nov., and Costatisporus cyanescens gen. sp. nov. are described as new to science. These sequestrate, hypogeous fungi were collected in Guyana under closed canopy tropical forests in association with ectomycorrhizal (ECM) host tree genera Dicymbe (Fabaceae subfam. Caesalpinioideae), Aldina (Fabaceae subfam. Papilionoideae), and Pakaraimaea (Dipterocarpaceae). Molecular data place these fungi in Boletaceae (Boletales, Agaricomycetes, Basidiomycota) and inform their relationships to other known epigeous and sequestrate taxa within that family. Macro- and micromorphological characters, habitat, and multi-locus DNA sequence data are provided for each new taxon. Unique morphological features and a molecular phylogenetic analysis of 185 taxa across the order Boletales justify the recognition of the three new genera. This material is based upon work supported by the National Science Foundation under Grant NSF-DEB 0918591 and NSF-DEB 3331108. Any opinions, findings, and conclusions or recommendations expressed on this site are those of the author(s) and do not necessarily reflect the views of NSF.